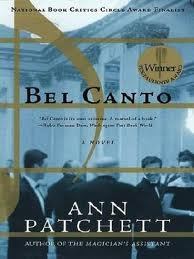 So awhile back when I was but a wee book blogger, I read Dawn of She is Too Fond of Books review of Bel Canto and knew that I wanted to read it myself. I bought it at a Borders (RIP) one weekend and then it promptly sat on my bookshelf for years. I continued to read good review after good review and continued to not read it. This year I decided to finally read it, and sure enough I waited until December. (some books have been on my shelves longer just sayin. Bel Canto should feel lucky!) There was a lot of pressure involved though, okay? Raych said about this book, "Unless you are one of those who totally hated this book, in which case you may have no soul." Pressssssssure. Okay so the premise of Bel Canto is that a special party is being held at the home of the Vice President in an unnamed South American country. It's being held in honor of a Mr. Hosokawa and to make it really special, they have invited his favorite opera singer. Opera is Mr. Hosokawa's reason for living essentially, so even though he has no plans to actually make whatever business deals he's there to make, he indulges in this exceptional party planned in his honor. The opening pages describe his love for opera and I have to admit they were completely breathtaking. I don't love opera in the same way, but I certainly love music and thought it was very moving. So anyway they are at this party and the president was supposed to show up, but he doesn't want to miss his soap opera so instead he stays home. But the terrorists were counting on him being there and they don't realize he's not...and so they take the party hostage anyway. They feel like somehow they have to be able to strike negotiations with the country anyway. And they are assigned a negotiator, and so the story goes. So basically what happens is you have all these people from different countries stuck together in the house and they can't all speak each other's language but there's one man there that's a translator of many languages. But more importantly, there's Roxane Coss who's an opera singer and when she sings, she is able to unite them in a way that only music can do. And it's beautiful. And during this time...four and a half months of stand-off with all these people stuck together in this house, they slowly start to build relationships of trust even with their captors. After all, a lot of them are young, teens, and you can find of feel the tragedy of their lives even if it's never explicit on the page. And since the terrorists aren't exactly cruel a lot of relationships spring up and the people bond. They fall in love, they feel deep affection for one another. They appreciate the wit, skills, and intelligence of each other. They even come to appreciate, in this sort of secluded life, different things they never had before, whether that be relationships or the time to spend on one's true passion and they often wonder, "how can I go back to life before?" The beauty of Bel Canto is that you're reading along and you're realizing all of these things with them, you're watching them build a brand new kind of life together and destroy the sorts of walls between them and the whole time you're just feeling so much dread. You know that it can't last, that in fact there are terrorists and there are hostages and there's a whole outside world that is continuing on try to figure out this situation, and Patchett weaves that feeling of impending doom into the narrative masterfully and then suddenly the next thing I knew, I was sobbing. I feel like Bel Canto is on the one hand, a love letter to opera or even more importantly the arts. It's through the early appreciation of the arts, one character tells Roxane Coss that he can now love her. It's the music that humanizes them all and breaks down walls. It's music that even after terrible things happen gives them hope in the world again. "All of the love and the longing a body can contain was spun into not more than two and a half minutes of song, and when she came to the highest notes it seemed that all they had been given in their lives and all they had lost came together and made a weight that was almost impossible to bear." I also think the music together with the exploration of time is interesting. It's only in forgetting time and imagining no past or future that many of the characters are able to enjoy the present. It's as if time has frozen for them and only in that freezing of time do the barriers come down and humanity prevails. In a weird way, this reminded me a little bit of the film Joyeux Noel which I highly recommend! They are completely different in setting, etc. just the idea of people setting aside their differences and seeing each other's humanity are similar. Anyway I loved the book, the writing is beautiful and the story is a heartrending and gorgeous tale.